For gravity-defying hair! Forget your regular conditioner that can weigh hair down, and experience the boosting abilities of our Full Bodied Leave-In Conditioner. This air-light serum based conditioner gives hair a beautiful bouncy, soft texture, plumping up skinny strands to give maximum volume. Forget back-combing, with our touch-to-style technology, you can tease hair into shape with a simple rustle of your fingers. Pea Peptides work as a disguise for skinny strands. The proteins act as a film former to help build up each strand for a gorgeous head of full and healthy looking hair. The hard working proteins continue to work over time, so your hair never falls flat. Our unique cocktail of Amino Acids is modelled on the same Amino Acids of the protein found in cell membranes, which bind the hair cuticle and cortical cells together in hair fibres, promoting lustre and conditioning. Low and medium weight plant-derived proteins condition the hair fibre inside and out for an air-light boost in volume. After washing your hair with Full Bodied Shampoo, apply 3-5 pumps of the leave-in treatment (depending on the length and thickness of hair) to towel-dried hair. Rub it well between both hands and smooth through the whole length of hair. Blow-dry and style hair as normal. Wash hands after use. Aqua (Water), Dimethyl Isosorbide, Hydrolyzed Wheat Protein, Parfum (Fragrance), PPG-26-Buteth-26, PEG-40 Hydrogenated Castor Oil, Polyacrylate Crosspolymer-6, Pisum Sativum (Pea) Peptide, Arginine, Aspartic Acid, Glycine, Alanine, Serine, Valine, Isoleucine, Proline, Threonine, Histidine, Phenylalanine, Sodium Lactate, Sodium PCA, PCA, Trisodium Ethylenediamine Disuccinate, Leuconostoc/Radish Root Ferment Filtrate, Sodium Benzoate, Phenoxyethanol, Chlorphenesin, Cinnamyl Alcohol, Alpha-Isomethyl Ionone, Linalool, Limonene, Butylphenyl Methylpropional, Hydroxyisohexyl 3-Cyclohexene Carboxaldehyde. I've been using this with the volumising shampoo and been loving it. It's given my weighed down hair a much needed boost plus it smells great and the packaging is just beautiful! Smells incredible and it works! I never usually bother with leave-in conditioners but I'm so glad I did with this one. My past experiences with similar products haven't been positive and I've ended up having to wash my hair straight after. This is completely different, was super lightweight when in the hair and left my hair feeling full with loads of volume! It also smells, so so good. Love this range! 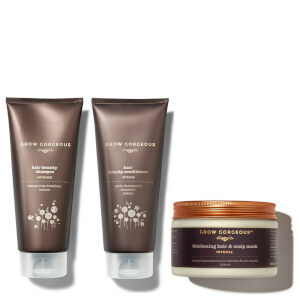 I've never used a leave-in conditioner before because I have fine hair and was scared that it would leave it feeling greasy but this definitely isn't the case with the Grow Gorgeous full bodied volumising leave-in conditioner. After blow-drying, my hair looks much fuller and the best thing about it is the volume stays ALL DAY!